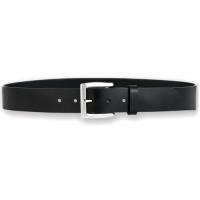 Keep pants up and gear secured with the SB14 1.50" Sportsman's Belt from Galco. Constructed from a single cut of premium Latigo leather, the Sportsman is built to last. Its sleek matte finish gives off a clean professional look that is perfectly suited for the office, while the pure rugged strength of the high-grade leather preserves its tactical functionality. Load the belt with service pistols, cuffs, batons and more without worry of it stretching a centimeter or sagging an inch. The nickel-plated, solid brass buckle is strong enough to stand up to the demands of tactical operations while maintaining a clean look for confident wear in the office. The ideal blend of tactical functionality and ruggedized fashion, Galco's Sportsman's belt deserves a place in every officer's wardrobe.